Have you got a gap that you don’t like? 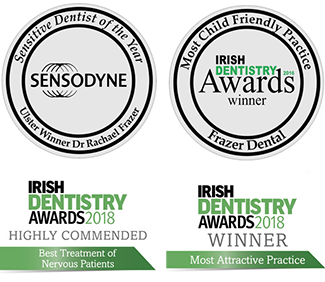 A bridge , dental implant or denture from Frazer Dental could be the answer to your problem. What is a bridge? 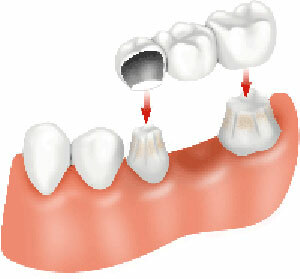 A bridge is used to replace a missing tooth. A bridge is a good option for anyone who doesn’t want to wear a denture, or who may not be suitable for a dental implant. The types of bridges available at Frazer Dental Kingscourt : Adhesive / Resin Bonded & Traditional fixed bridges. This is a sticky bridge, cemented to the adjacent tooth , without drilling down the tooth. A small groove is placed in the back of the adjacent tooth, with no need for anaesthetic ! This type of bridge relies on the strong cement used to bond the bridge to the adjacent tooth. Adhesive bridges look very natural and are great for nervous patients as all we need to do is make a small groove in the adjacent tooth and take an impression( mould) of your teeth. This is usually done without the need for anaesthetic. A crown/cap is made for the adjacent tooth and another tooth( the bridge tooth to fill the gap) is attached to the crown. This type of bridge is also very natural looking . A traditional fixed bridge will involve removing slightly more tooth to make enough space for the cap/ crown to go over the adjacent tooth, and anaesthetic will be given to ensure the procedure is comfortable for you. A temporary bridge will be fitted for approximately 2 weeks ,while the permanent bridge is made for you.